Is it really possible to find glory in the everyday circumstances of our lives? 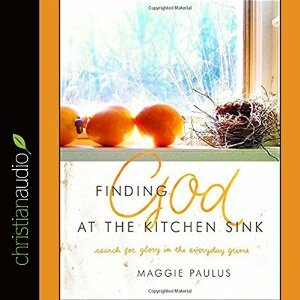 I had the great pleasure of narrating Finding God at the Kitchen Sink: Search for Glory in the Everyday Grime for Christianaudio in which author, Maggie Paulus, shows us how to do just that! Through her inspiring down-to-earth stories and reflections, Maggie Paulus gently walks us through her everyday encounters with God in an effort to demonstrate just how much God wants to meet you right where you are, no matter what your circumstance, no matter where you are in your life, no matter how badly you may have messed up. Even at a kitchen sink full of grimy dishes – God is there. This entry was posted in Audio Books, News, Press and tagged Christian Audio; Christian, Faith Based; Spirituality;, Susan Hanfield; Narrator; Audiobook; Moody Publishing; Maggie Paulus. Bookmark the permalink. ← Last Chance to see PHAEDRA – final two shows this weekend!